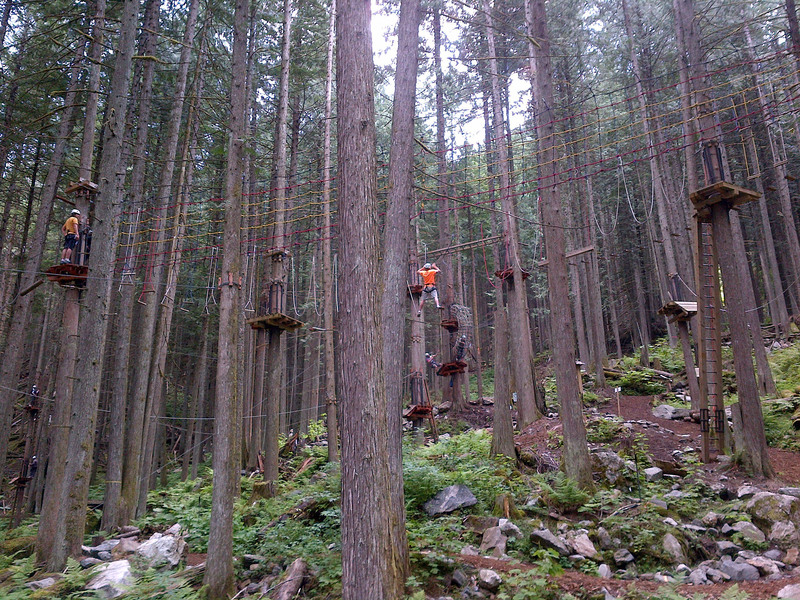 SkyTrek Adventure Park is nestled into the giant old-growth cedars near Revelstoke, British Columbia. 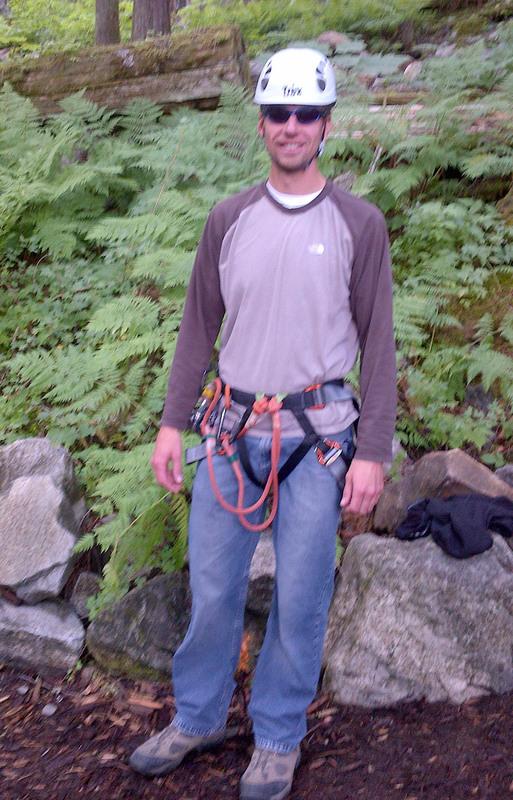 Recently, we decided to take on the park’s High Ropes Course challenge. This is an outdoor adventure activity that tests your physical and mental strength, stamina, agility, balance and flexibility. The course is built using arborist approved trees and constructed with environmentally sensitive methods that do not harm the trees. 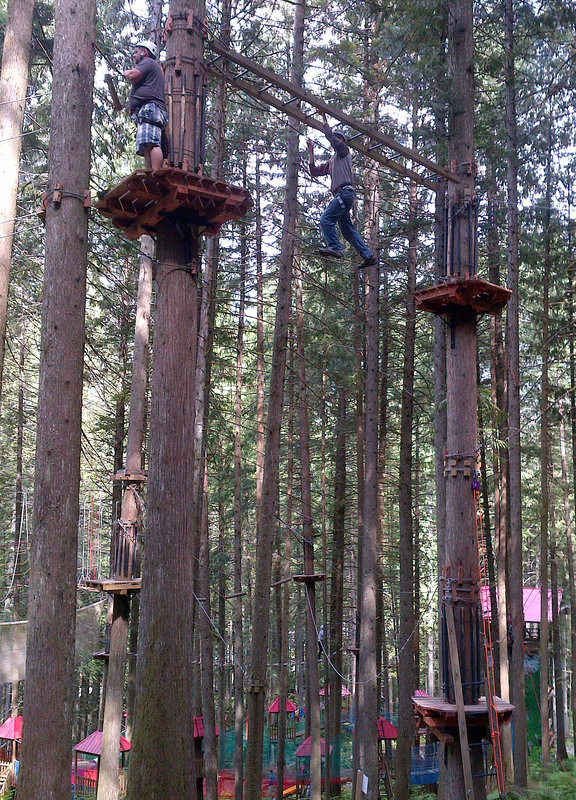 We climbed from tree to tree on ladders, scrambled up nets, over suspended bridges and swinging logs, and flew down zip lines. So here comes the point in my blog post where I have to be completely honest and admit that I didn’t finish the challenge. The course is divided into three levels – green, blue and black – with each level getting more difficult. I made it through the green and blue levels and then made the decision to stop while I was ahead. The boyfriend went on to complete the black level and even did a few double blacks. Very impressive. And yes, I gave him permission to rub it in that he completed the entire course and I didn’t! I’ve thought about it and decided that my age is showing. Several years ago, even a few years ago, I would have completed this course without flinching. After all, I’ve jumped out of an airplane and done other extreme adventures! But as I get older I seem to be losing my sense of adventure, or at least extreme adventure. Now I find myself not wanting to get hurt. And that’s OK. I can challenge myself in other ways. And I may throw in the occasional extreme adventure! 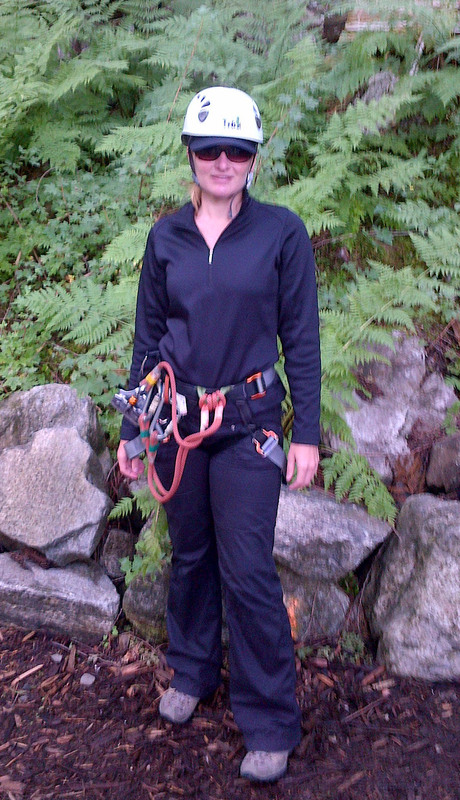 Here are some photos from our recent high ropes challenge. 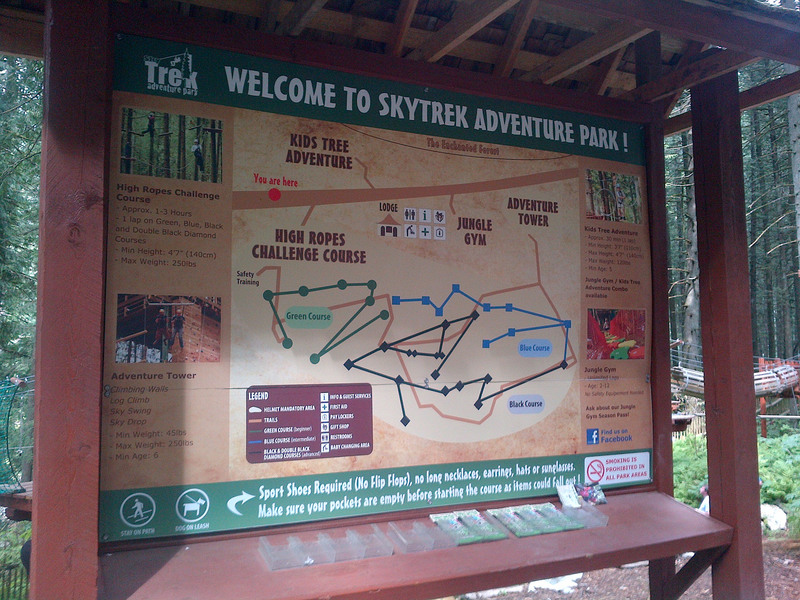 Welcome to SkyTrek Adventure Park! Keith all geared up ready for the challenge. 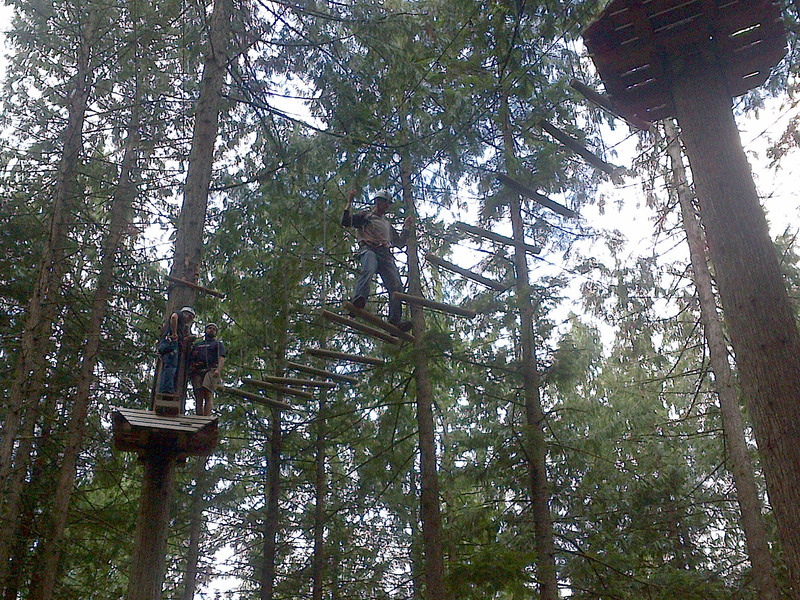 Part of the High Ropes Course. Keith on the “monkey bars” – part of the black level. Keith taking on another challenge in the black level. Hey, don’t be so hard on yourself. It’s ok to not do the black or doubles. We need to accept what we like and not be pushed to do more. I am proud to know you did the green and blue levels. I say those levels are very adventurous. You are perfect without having to do the blacks…. Thanks Sandra. I appreciate the kind words. I did some of this in Mexico but it looks like some of the black levels were really hard at the place you went to; no “monkey bars” at the place I went to. I bet the ziplines were fun though. It was lots of fun… and a bit scary! Thanks for reading!